The significance of a corrupt free society cannot be overemphasized let alone in the University system which is meant to model good character for the future leaders of tomorrow. This was extensively discussed by representatives of the Independent Corrupt Practices and other Related Offences Commission (ICPC) at a One-day sensitization seminar with the theme “Corruption and its effect on the University System”, organised by the Anti – Corruption and Transparency Unit of the Federal University of Technology, Minna held on Tuesday, June 4, 2013 at First Bank Lecture Hall, School of Agriculture and Agricultural Technology (SAAT), Main Campus, Gidan Kwano. The first speaker, Mr. Henry Umore, ICPC Zonal Co-ordinator, Lokoja who presented a paper titled “Corruption in the Academia; Challenges before a Purposeful Leadership” said everybody in the University system is likely to be involved in corrupt practices through parents, students and staff so we must all collectively and consciously come together to fight the monstrosity called corruption before it consumes us. Mr. Umore further said that one of ICPC’s functions is to advice and instruct agencies and parastatals on ways to eliminate corruption. He stated that corruption is a dishonest, selfish, anti-social and anti-ethical act which should be frowned at in all its ramifications and whoever is caught in the act should be made to face the full wrath of the Law. The representative of ICPC’s Chairman, Mr. Oche Godwin delivered a paper titled “Detection and Control of Corruption in the University System”. He reiterated that the University Management should put mechanisms in place to enable them identify corrupt prone areas in the system such as: good internal reporting systems, effective complaint system and availability of information to all stakeholders. 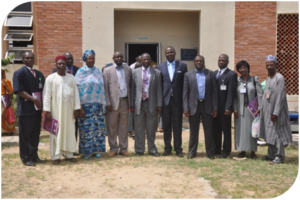 He noted that ICPC is ready to work with the University through ACTU to wage an effective and sustained war against corruption. He further disclosed that the fight against corruption in the University system is everybody’s responsibility, so that Nigerian Universities can take its pride of place in global ranking. The Vice Chancellor, Prof. Musbau Adewumi Akanji, FNSBMB, in his address revealed some of the areas that are prone to corrupt practices in the University system to include: admission processes, examination, compilation and computation of results, appointments, transcripts, award and execution of contracts. He appealed to everybody not to take part in any of these and said whoever is caught in such acts would be asked to leave the system as his administration has zero tolerance for corruption. The VC also congratulated ACTU on the success of the seminar and challenged them to bring the corrupt culprits to book and hoped that corruption in the system would be reduced to the barest minimum. He further advised that everyone should do their own little bit by ensuring that people around them are sensitized about the evils of corruption. Prof. Akanji further tasked ICPC representatives to go back and fight corruption from the top. Dr. Peter Ida, a member of ACTU, FUT, Minna in his vote of thanks appreciated the Management and participants for their attendance and promised that ACTU would organise more sensitization seminars for the University community.